Wish to share your memorable trips or events to your friends and family? Slideshow maker for Mac is always a great way to organize and make your photos more interesting. No matter you're going to make a live presentations to knock the socks off your audience, make a wedding slideshow to make the couple happy, create a travel photography to relive the adventure, or keep your family photos in a slideshow video for a loving memory, the best slideshow maker Mac 2018 will make all done on Mac without any hassle. In this article we are going to discuss top three impressive slideshow maker for Mac 2018, which enables you to make photo slideshow with music and save them to popular formats like MP4, MOV, AVI, FLV etc. Thus you can enjoy your photo slideshow video on other platforms like smartphones and computers. MacX Video Converter Pro is undoubtedly the best slideshow maker for Mac in 2018. Don't get confused by its name. Though it's wrapped with Mac video converter program, it really works seamlessly as a reliable slideshow maker for macOS (10.5 Leopard - 10.13 High Sierra). It enables you to make photo slideshow videos with music from a library of photos, such as creating a wedding slideshow, making a baby growing up photography, making a presentation etc. 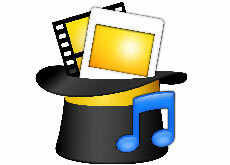 Besides, you're also able to convert the slideshows to MP4, MOV, AVI, MKV, FLV and 180+ formats. So you can free upload slideshows to YouTube, Facebook, Vimeo etc or transfer customize slideshow video to iPhone iPad Android for watching on the go. At the very beginning, you need to free download the 2018 slideshow maker for Mac and launch it. Likewise, if you'd like make a slideshow from Windows photo library, you can move to slideshow make for Windows. Step 1: Click Picture to load the file folder of photos, which you plan to create a slideshow. Step 2: Choose the output format from the automatically popped up window. More than 108 video formats and 350 preset profiles are available to choose. 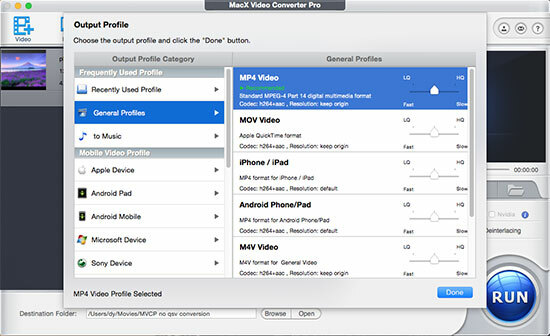 MP4 format is highly suggested for uploading online, editing on iMovie, Final Cut Pro, playing on QuickTime, iPhone iPad, Mac, Android tablets and smartphones. Step 3: Click Edit to customize your slideshow switching mode; photos order sorted from location, creation date or file name; photo playback interval; add or delete items from photo folder, add music to the slideshow etc. Step 4: Hit Browser button to determine where you'd like to save the slideshow to. Then tap RUN icon to start making a slideshow with music on Mac computer. Of course, 2018 slideshow maker Mac is not confined to MacX Slideshow Maker, but also some other programs. 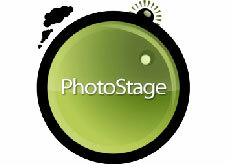 Among them, PhotoStage, FotoMagioco 5, and Movavi ranks the top three of slideshow making software. It's a free Mac slideshow maker that helps put together a slideshow from your digital photos and add music, video clips and narration. Moreover, this best slideshow maker for Mac also features as an video editor for Mac, which enables you to apply effects such as crop, fade, crossfade, zoom, and burn slideshows to DVD or create video files (MP4, MOV, AVI, FLV etc.) for sharing on the web or portable devices. This slidershow maker Mac free presents you an absolutely trouble-free way to make a vivid slideshow on your Mac while using your existing photos, music and text. With this program, you'll eventually create a high-resolution video regardless of wedding, travel, Christmas slideshow. It also offers you 4K Ultra HD resolution and splitting fast speed for slideshow creation. Movavi Slideshow Maker for Mac is absolutely the emerging slideshow maker for Mac recently. It makes photo slideshow on Mac within easy steps. All you need to do is to upload your image, choose a couple of settings and the program will do the rest for you automatically. Even if you're a beginner, you can also make photo slideshow on Mac with music easily thanks to its intuitive interface. PhotoSnack is probably the best free slideshow maker 2018 and an incredibly easy app you can use to make slideshows with music. Choose PhotoSnack to share the important moments in your life with friends and family. As long as you sign up Photo Peach for free, you are able to create simple slideshows without some fancy effects or transitions. Upload & arrange your images, Choose title & music, and Share your show or embed it in your blog/website. This site not only make slideshow videos for photography and family, but also marketing videos for business. Animoto elevates your images into something so much more professional and amazing with 3 steps only. Set the tone, customize it and finalize it, all done! 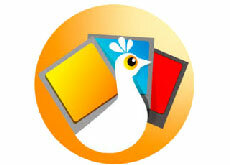 The online slideshow maker, 123 Slideshow have an access to adjust the size of your slideshow without software installation required. Like other online slideshow making sites, you can make a photo slideshow on Mac or Windows following steps below: upload your pictures, setup some text or hyperlinks, adjust speed and colors and download your slideshow and integrate it on your site. MacX Video Converter Pro is rated as the best slideshow maker for Mac (macOS High Sierra incl.). It helps you make customized slideshow videos on Mac with HD or 4K UHD quality. 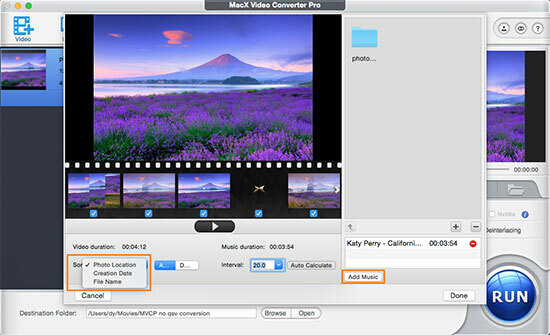 You can also add music to the slideshow, adjust the settings, edit on iMovie, or convert it to mp4, flv etc for sharing.